DEK Pre-saturated wipes allow for fast, efficient, convenient and effective cleaning on the factory floor. DEK IPA/DI wipes – For general cleaning applications. 70% IPA, 30% de-ionized water. 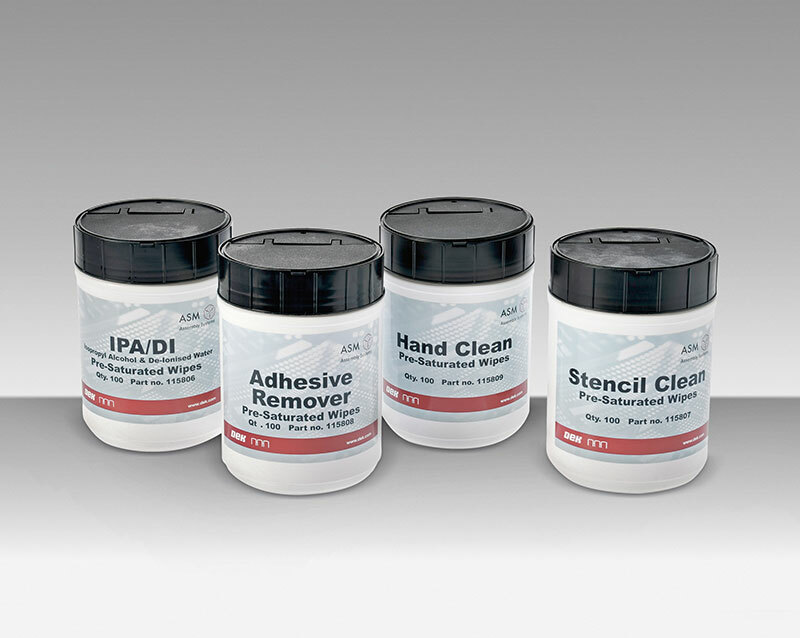 DEK Stencil clean wipes – For effective, non-abrasive cleaning of surface mount stencils and screens. DEK Adhesive remover – Quickly remove adhesives from surface mount stencils and screens with a particle-free, controlled evaporation cleaner. DEK Hand cleaner wipes – Pre-saturated, disposable wipes are ideal for environments where cleanliness is required for critical component handling.